Nepal has been classified as a least developed country with a large fraction of population under poverty level. Although the country is bestowed with very good amount of important natural resources, these resources have not been tapped and utilized for the benefits of the population. The industrial development is still in its primary stage. Due to political instability and load shedding in the supply of electrical power, the existing industries are suffering and the growth rate of the sector is declining. Many of the industries have closed. The operational industries are also not doing well. Their productivity levels are found to be low. Resources are not used efficiently. Most of the industries face the complaints from the public residing near them due to their poor environmental performance, effluents and emissions. Inability of the industries to enhance productivity and competitiveness has affected the employment generation and therefore significant numbers of youths are leaving the country to work abroad and to earn their living. Industries are found to discharge their wastes directly to the natural surrounding without much effort to minimize their volume or toxicity. As a result, the natural resources such as rivers and lakes near towns and industrial belts have degraded beyond use and the air quality has deteriorated to an unhealthy level. The discharged wastes have also adversely affected flora and fauna nearby. Also industrial workers in the country are exposed to excessive dust, harmful chemicals, high levels of noise, unsafe work practices and wrong working postures resulting in accidents and occupational diseases. Nepalese people going for foreign employment also suffer due to lack of awareness and knowledge on Occupational Health & Safety. Society for Environmental and Economic Development Nepal (SEED-Nepal) has been established in 2005 to provide solutions for enhancing productivity, preventing industrial pollution; providing better working environment, and improving the quality of life. 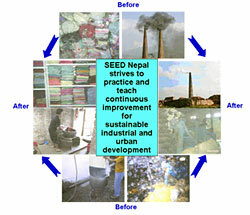 SEED Nepal has been established by a group of totally committed professionals. Long years of valuable experience of the persons involved in industries, similar projects, environmental administration, and especially their hands-on experience with the DANIDA supported Environment Sector Programme Support (ESPS) is the biggest asset of SEED-Nepal.